Expectations that business will respect, and in some cases support or help fulfill, internationally recognized human rights have increased over the past decade. Businesses have recognized the importance of effective management systems in responding to these expectations and protecting core resources needed in their own activities. 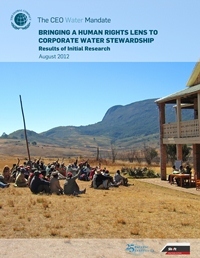 The report Bringing a Human Rights Lens to Corporate Water Stewardship: Results of Initial Research is part of a project by the UN Global Compact CEO Water Mandate which seeks to develop practical guidance for businesses on implementing their responsibility to respect the human right to water and sanitation. This two-phase project begins with understanding and elucidating international and national legal trends relating to the human right to water and sanitation (HRWS), illustrating some of the current challenges businesses face in respecting this right, as well as the perspectives of potentially affected communities, and lastly identifying areas of potential synergy with companies’ existing water stewardship efforts. The second, more substantial phase will incorporate this research into the process of developing robust practical guidance, with significant input from Mandate endorsing companies and expert stakeholders on implementing respect for the human right to water and sanitation. E discusses a number of cases relating to corporate respect for the human right to water and sanitation drawing on actual corporate practice. 5. Section F: discusses some areas of potential difference, and also synergy, between the UN Guiding Principles and current corporate water stewardship practices. The research was conducted and the paper developed by the Pacific Institute and Shift in close consultation with Oxfam America– and with input from almost a dozen technical experts and CEO Water Mandate Human Rights Working Group members who agreed to advise the project team.